What a year 1962 was for director Blake Edwards. Days of Wine and Roses is the better known of the two films he directed that year, but Experiment in Terror deserves recognition too. 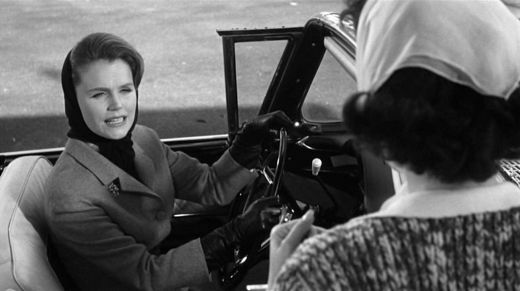 Working with the same leading lady (Lee Remick), cinematographer (Philip H. Lathrop) and composer (Henry Mancini), Edwards crafted a stark, tense thriller about 180 degrees from the director’s perennial favorite The Pink Panther (which was released only one year later). Edwards hooks us immediately, with no set up to speak of, as Kelly Sherwood (Remick) arrives home after dark only to be assaulted and held at gunpoint in her own garage. The culprit explains exactly what he expects of her. Kelly is a bank teller and she is to steal $100,000 for him (he claims he’ll cut her in on 20% of the take, yeah right). He also knows everything about Kelly’s life, including that her teen sister Tody (Stefanie Powers) lives with her. He’ll go after Toby if Kelly refuses to comply. Though scared witless, Kelly is resourceful enough to contact the FBI and establish a strong connection with Agent John Ripley (Glenn Ford). Ripley works on the case, eventually uncovering the identity of the criminal as well as some of his associates. A cat-and-mouse suspense thriller unfolds; taut and fast-paced (the film feels considerably shorter than its 123 minute running time). Remick is perfect as the heroine who refuses to lie down before the man threatening her. Ford is subtle but reliable as the stoic FBI agent determined to crack the case. And as the villain, Ross Martin is miles away from his most famous role as Artemus Gordon on The Wild Wild West. Twilight Time, as with all their releases, has made Experiment in Terror available as a limited-to-3,000 copies Blu-ray edition. Their audio/visual presentation is outstanding, with Lathrop’s black-and-white cinematography displayed with exacting contrast levels that show off every shade of gray perfectly. Sharpness and detail is strong, especially on close-ups and medium shots (some of the wide shots, particularly outdoors, are just a tad on the soft side but likely inherent in the cinematography). A surprisingly great 5.1 DTS-HD MA surround mix is included, expanding the original mono tastefully. Mancini’s score sounds crystal clear. Certain sound effects are effectively pushed up in the mix maximize the tension. The sole special feature is a DTS-HD MA 2.0 mix isolating Mancini’s evocative score. As usual, Julie Kirgo’s liner notes – found within the included booklet – are a worthwhile way to find out more about the movie. Experiment in Terror is an obscurity that deserves to be rediscovered. The Blu-ray can be purchased, while supplies last, through Twilight Time’s distributor, Screen Archives.